Super Socks5Cap = sockscap + socks finder + socks checker, is a program that allows network applications that do not support working through proxy servers to operate through a HTTPS or SOCKS4/SOCKS5/SSH proxy server and Super Network Tunnel Client/Server proxy and support NTLM identification, and can connect any destination port bypass firewall ) . 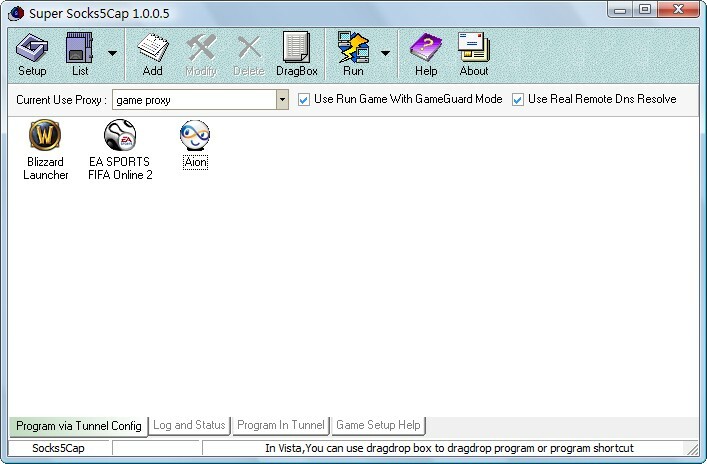 Like 'sockscap', can tunnel tcp / udp connection , but it support vista and windows7/ X64 bit. Use five types of proxy servers: SOCKS v4, SOCKS v5, HTTPS, Super Network Tunnel C/S Proxy, SSH Proxy. Resolve DNS names through a proxy server (fake mode) and also support real remote DNS resolve.